Having spent a good amount of time with this guitar, we can again affirm that this technology is not a gimmick that quickly loses its shine. A well-balanced voice that’s a great platform for the inspirational effects you can conjure up. The actual guitar spec may be a sticking point at this price and we’d expect a gigbag included. The acoustic world is maybe not the first place you would look for technological innovation. Software and circuits may be constantly evolving but it’s sometimes tempting to regard old-fashioned wood and steel as materials that have reached their peak of evolution. Not the case; there is plenty happening in acoustic guitar design that has the potential to change the way we play for good. Taylor’s recent V-Class bracing, which we looked at in the last issue, is a revolution in structural design and the steel-string voice. But in its own way Yamaha has proved just as willing to shake things up with its TransAcoustic technology. The essence of the idea is simple but, in the flesh, it is quite an experience. TransAcoustic uses the guitar’s own body as the ‘speaker’ for built-in effects such as reverb and chorus, meaning you can summon a lush, effects-laden sound from your acoustic guitar without ever plugging into an amp. The ability to do this without any outboard equipment feels a bit surreal - but also represents a ‘why hasn’t anyone thought of this before?’ moment. The outward appearance of the guitars is perfectly traditional, so you’ll have to look beneath the surface for clues as to how TransAcoustic works. The onboard effects are generated by an actuator that can be found on the inner surface of the back of each guitar. The TransAcoustic circuitry ‘listens’ to the vibrations of the strings during unplugged use, applies effects to that signal, then sounds the effected signal through the guitar’s body itself via the actuator, in effect using it as a speaker. Initially only available in the higher-end LS-TA launch model, TransAcoustic is now available in two, cheaper models: the FG-TA dreadnought and the concert-size FS-TA, based on the design of the company’s FG-820 and FS-820. With a significantly lower retail price than the LS-TA, there’s now extra incentive for the curious to take the plunge. But does the technology and the unique sonic experience of these guitars offer add up to a compelling proposition for the price? Yamaha knows better than most how to make quality acoustics at a wide range of price points, and the Chinese build here is tidy in both cases: frets are well finished and both guitars have a finger-friendly low action with enough tension to tune down comfortably (they ship with 0.012s). The smooth satin necks found on this otherwise gloss-finished pair also offer a welcome enhancement to playing comfort. The Vintage Tint of our dreadnought-size FG-TA ‘Traditional Western’ lends an attractive darker-hued aesthetic to its spruce top, though it doesn’t have Yamaha’s resonance-enhancing ARE treatment that featured on 2016’s LS-TA and LL-TA Engelmann spruce-topped models. The FG-TA has punch and clarity across the spectrum that may be attributable to Yamaha’s move to scalloped bracing for the FG Series design in 2016. Scallop bracing’s calling card of strong projection is certainly evident on both these guitars. It provides an excellent foundation for the TransAcoustic features these models host. Holding down the level control (the middle of three rotary controls on the upper bout) for a moment activates the TransAcoustic mode. From there you can dial in a reverb type, from room to hall, and a separate chorus. We soon gravitate to the hall reverb for the drama it brings to any fingerstyle we throw at it. Even in its more extreme settings it’s still usable and organic, and while a new pedal or amp can certainly be inspiring, having effects that travel with you everywhere on the guitar ups the ante when it comes to creative inspiration. We found we needed to be a little more cautious with the chorus level, but setting it at about 10 o’clock proved great for adding shimmery enhancement to chord work with a touch of room reverb giving the depth of a studio-recorded acoustic. Turn it up to for a deeper modulation and you get a fair way into 12-string territory - trying to resist some Stairway... action is difficult. It’s addictive stuff and the chances are it’ll make you want to play more and come up with more ideas as a result. Yamaha’s SRT piezo system is good enough for the likes of Billy Corgan, who uses the passive version in his Yamaha LJ16BC signature model, and here the plugged-in experience places the emphasis on the onboard effects rather than EQ. That means tone-shaping will have to come from the PA, amp or preamp pedal but the essential unplugged character of both these guitars is reproduced pretty well by the pickup system alone, before EQ is applied. The TransAcoustic effects also give you a different kind of control at your fingertips. The easy to use controls make it easy to bring in different effects during a set as the material demands. Packing all that in at this price means these may not be your do-it-all recording and gigging acoustics in the longer term, but there is sufficient quality to record and gig with here - though you’ll need to pay out extra for a gigbag to take either model out and about as they’re not included in the price. There is, understandably, a premium to be paid for this unique technology. The equivalent spec FG-820 model without TransAcoustic retails at £335... you can see where we’re heading with the math. For the extra outlay you’re getting both Yamaha’s SRT passive pickup and the TransAcoustic actuator built in. While the worth of that to any given player can only truly be settled by trying it, we think that the experience really could seal the deal. It’s also worth noting that if you want a higher basic spec in the guitar itself while keeping TransAcoustic aboard, there are options on hand. The earlier LS-TA and LL-TA models, with solid rosewood back and sides, Engelmann spruce ARE-treated tops plus ebony ’boards and bridges (and a hard bag), can now be found on the market for competitive prices, making them even more compelling propositions for the money. Having spent a good amount of time with this guitar, we can again affirm that this technology is not a gimmick that quickly loses its shine. 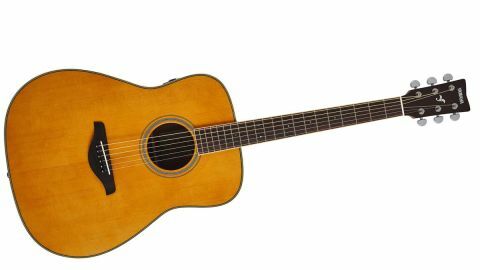 This guitar is well built and offers a fine playing experience - but the TransAcoustic technology pushes its potential into a new realm. The onboard reverb is especially inspiring, allowing you to dial in great room ambience and sustain anywhere you go. The idea of applying effects to acoustic tone is not new - but the fact you don’t need to plug into anything to get that sound can’t be matched by any other guitars on the market. Yamaha’s innovation encourages creativity, and this more affordable model will hopefully mean more can experience it.